If you’re on the look out for a new nourishing breakfast option chai quinoa porridge is the way to go. Quinoa is wonderfully diverse and is something I never even would have thought of using for creating porridge. Sarah Tanner from Greenleaf Organics let us in on how to create this tasty dish using Ceres organics quinoa. Using the Ceres Organics quinoa is great for the environment as they have brand new home-compostable packaging. The packets are made from renewable resources such as wood pulp and wood-based ink. You’ll just love how warming and soothing this chai quinoa porridge is. To save time, leftover quinoa from previous meals will do the trick! Simply make an additional cup of quinoa when you’re making your other meals and you’ll have breakfast in no time the next day. Easy as. Add all the poached pear ingredients to a pot over a high heat and bring to the boil. Reduce heat and simmer for around 30 minutes, or until the pears have softened. If you prefer a thicker consistency, remove the pears and continue simmering the syrup until it has thickened. This can take up to 10 minutes. Remove from the heat and set aside. Add cooked quinoa to a pot with the remaining porridge ingredients and bring to a gentle boil. Reduce heat and simmer for around 5 minutes, stirring continuously, until thick and creamy. 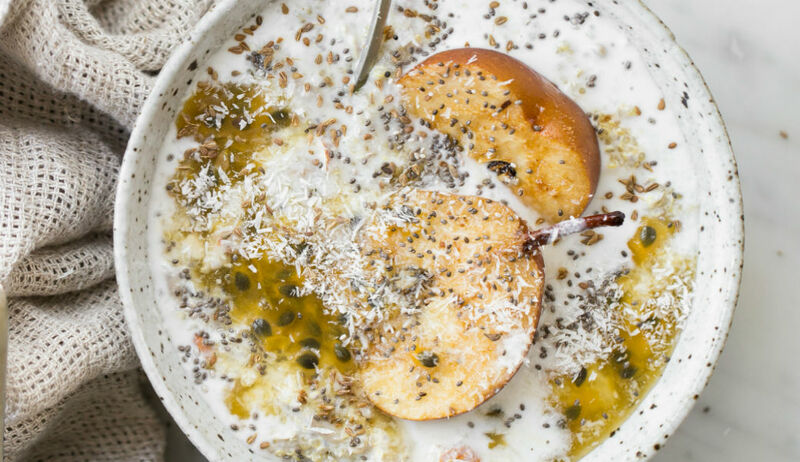 Serve porridge in bowls with the poached pear and a drizzle of the poaching syrup. Sprinkle with a little dusting of cinnamon or extra maple… or for a decadent touch, some shaved dark chocolate.